Dr. Jason Koontz, Director of Percussion Studies at EKU, will present his faculty recital, "Three Karnatic Temples," which will exclusively feature music composed by Koontz performed on a variety of instruments, including North Indian tabla, marimba, vibraphone, steel pan, and the dulcimer guitar. Several musical premieres are on the recital program, including “Three Karnatic Temples” (concertino for marimba and percussion ens), “Hampton Ridge” (for dulcimer guitar, mandolin, cello, and doumbek), and “Lorelei” (for vibraphone, marimba, cello, and doumbek). 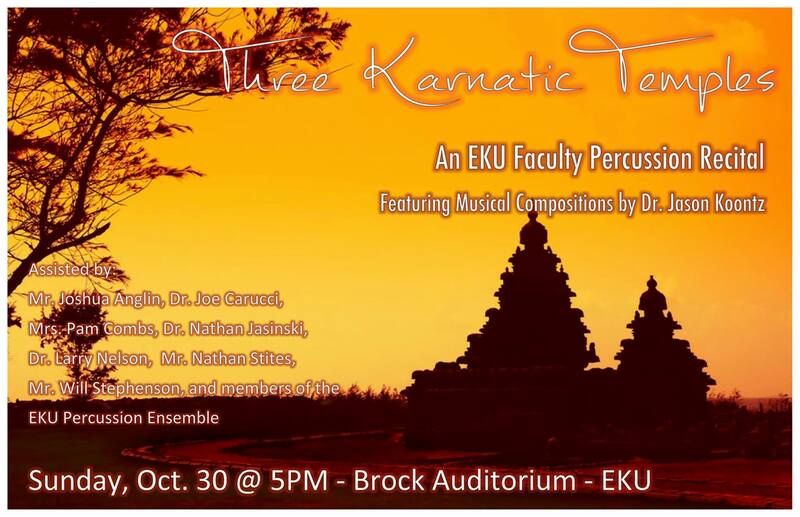 EKU faculty/musicians Larry Nelson, Nathan Jasinski, Nathan Stites, Pam Combs, and Joe Carucci will assist Koontz with the performances. Musical traditions from India, East African, Appalachia, and Brazil are represented in the compositions, creating a fusion of musical styles and influences. Sponsored by the School of Music and the Asian Studies Program. Event Date & Time: October 30, 5 p.m.